Distribution: Throughout state, less common in northern New Hampshire. 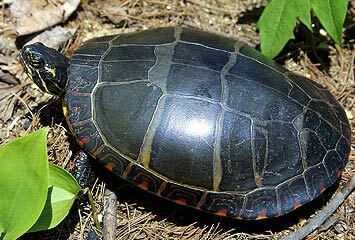 Description: A 4-6 inch turtle with a smooth carapace and light lines running across the back (created from the straight rows of the large scutes on the back). 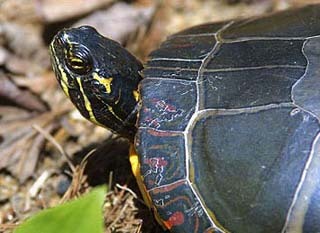 The head and neck streaked with red and yellow stripes. There are two yellow spots behind each eye. 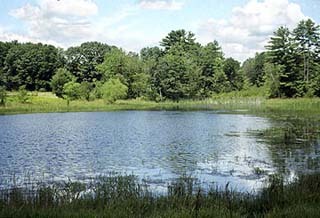 Habitat: Wetland areas with an abundance of vegetation and basking areas such as shallow ponds, marshes, bogs, slow-moving streams, and lakeshores. 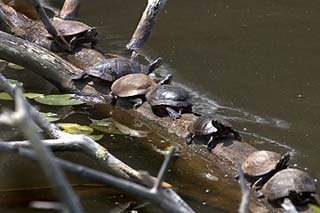 Often seen basking on partially submerged logs or rocks in large groups. Life History: Nest usually close to water’s edge in sandy or loamy area with open canopy. Typically 5-8 eggs are deposited in shallow, excavated depressions. Up to 2 clutches may be laid in a year. Hibernate in mud bottoms or under submerged logs. Conservation Threats: Road mortality, increased abundance of subsidized predators (e.g., raccoons), collection, and habitat loss & degradation. 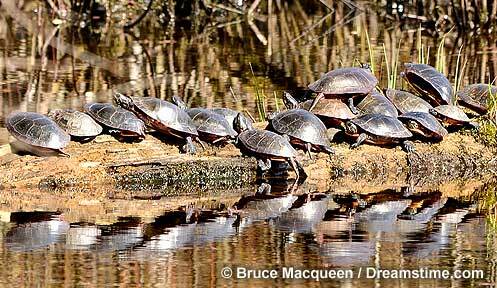 Painted turtles are colorful turtles with yellow markings on the head and neck and orange to red marks on the limbs and shell margins. 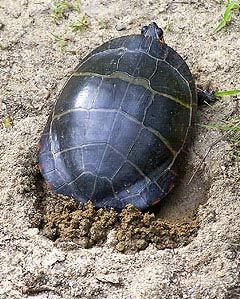 Female painted turtle digging nest to lay eggs. 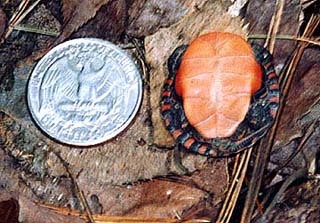 Hatchling painted turtles are small and have an orange plastron (lower shell).